The first time Heidi Carrier participated in a strawberry eating contest at the Ponchatoula Strawberry Festival as a child, she lost. “I didn’t know you had to eat the caps to win,” Carrier says with a laugh. Since then, she has more than made up for the loss. In June, she won the title of Louisiana Strawberry Queen and officially began her reign in July. Now the 20-year-old Amite native and sophomore at Southeastern Louisiana University is tasked with promoting the same strawberry eating contest and a multitude of fun offerings at the Strawberry Festival, which will take place April 12-14 this year. The Ponchatoula Strawberry Festival is one of about 400 festivals in Louisiana, according to Katelyn Yates, who works with queens across the state through the Louisiana Association of Fairs and Festivals. While the Capital City does not have any festival queens—only Mardi Gras queens—Yates estimates that there are hundreds of festival queens throughout the Bayou State. They all spend a year wearing their crowns and publicizing the unique festivals they represent throughout the state and beyond. “Every weekend I’m somewhere in Louisiana being a walking, talking ambassador for the Louisiana Strawberry Festival,” Carrier says. Carrier’s work as Strawberry Queen recently took her to Washington, D.C. for that city’s Mardi Gras celebration, which she describes as an amazing experience that came with some surprises. “We wear our banners that say our title, and on the back they say our name. I had my jacket on so you couldn’t see my name, and I’m walking through the Capitol building and all of a sudden, I hear, ‘Heidi! Heidi!’ And I’m thinking, ‘Who in the Capitol knows my name?’ and it was [U.S. Rep.] Steve Scalise, who talked to me and said it was so great to meet me, and I was like, “No, it’s so great to meet you!”’ Carrier recounts of Congressman Scalise, who represents Amite as part of Louisiana’s 1st Congressional District. At the Mardi Gras ball in D.C., Carrier remembers being overwhelmed by the experience of representing her home state. 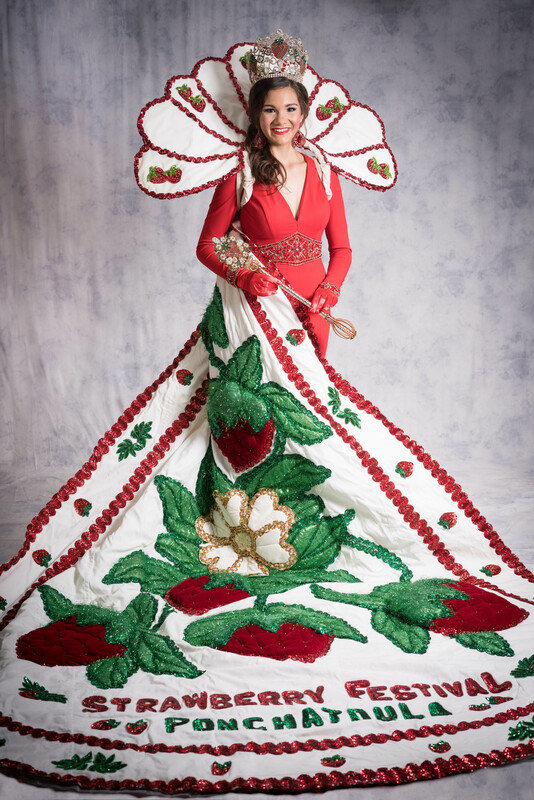 Serving as Strawberry Queen has been the culmination of a lifelong dream for Carrier, who can’t remember the last time her family didn’t attend the Strawberry Festival. Find out more about all the fun planned for this year’s Ponchatoula Strawberry Festival by visiting the event website. And savor the season by checking out some of inRegister’s fresh new strawberry recipes here.